March 29, 2019 – Columbus, Ohio – The Interscholastic Equestrian Association (IEA) will hold the second annual Western semi-final competitions on April 6–7, 2019 in Murfreesboro, Tennessee, and April 13–14, 2019, in Columbus, Ohio, for IEA riders in grades 6–12 from across the nation. 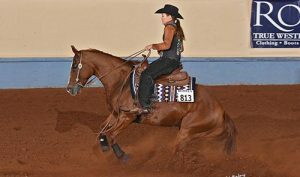 Youth Western riders competed in regular season shows in their respective regions using a draw-based system, whereby riders draw their mount from a supplied pool of horses. Each region also conducted a post-season Regional Finals to determine which teams and individual riders qualified for these semi-final events. The top three riders and teams from each region move on to the semi-finals. The first semi-final will be held at Middle Tennessee State University Miller Horse Science Center & Coliseum in Murfreesboro, Tennessee. This event will be judged by Allen Mitchels (AQHA, NRHA, NSBA, NCHA, NRCHA) and Kim Myers (AQHA, NRHA, NSBA, APHA). The second semi-final will be held at the Ohio State Fairgrounds and Expo Center in Columbus, Ohio, and will coincide with Equine Affaire—one of the largest equine expos in the United States. This event will be judged by Debbie Kail (AQHA, NSBA) and Carla Wennburg (AQHA, NRHA, NSBA). Over 150 qualified riders will attend each semi-final competition. The top six teams and individual riders from each semi-final will progress to the IEA Western National Finals to be held on June 15–16, 2019 in Oklahoma City, Oklahoma, during the NRHA Derby. Major sponsors for the 2019 IEA Western Semi-Finals include the title sponsor, the National Reining Horse Association (NRHA), along with Bob’s Custom Saddles (Official Western Saddle Sponsor of the IEA), C4 Belts, Cinch Jeans, Equine Affaire, Kimes Ranch, and Matt Mills Reining Horses. A full schedule for both Western Semi-Final events can be found at www.rideiea.org.